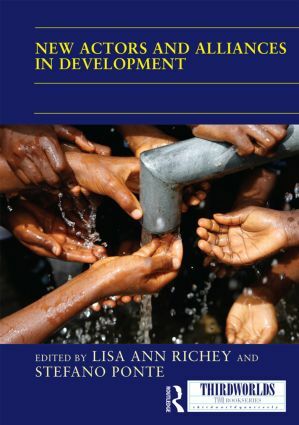 Lisa Ann Richey is Professor of International Development Studies at the Department of Society and Globalisation, Roskilde University, Denmark. She is the author of Brand Aid: Shopping Well to Save the World with Stefano Ponte (2011), Population Politics and Development: From the Policies to the Clinics (2008), and the co-editor of "Women and Development: Rethinking Policy and Reconceptualizing Practice" (special issue of Women's Studies Quarterly, 2003). She works on new actors in international aid, citizenship and body politics, and gender and the global South. Stefano Ponte is Professor of International Political Economy at the Department of Business and Politics, Copenhagen Business School, Denmark. He is interested in how the global economy is governed and in how developing countries and emerging economies fare in it. His work examines how standards, labels and certifications on social and environmental conditions of production shape agro-food value chains. In recent research, he has been examining the increasing importance of celebrities and branding in mobilizing ‘compassionate consumption’ and new forms of corporate social responsibility that are ‘distant and disengaged’. His most recent books are Brand Aid: Shopping Well to Save the World (co-author with Lisa Ann Richey, 2011) and Governing through Standards: Origins, Drivers and Limitations (co-editor with Peter Gibbon and Jakob Vestergaard, 2011). THIRDWORLDS will focus on the political economy, development and cultures of those parts of the world that have experienced the most political, social, and economic upheaval, and which have faced the greatest challenges of the postcolonial world under globalisation: poverty, displacement and diaspora, environmental degradation, human and civil rights abuses, war, hunger, and disease. THIRDWORLDS serves as a signifier of oppositional emerging economies and cultures ranging from Africa, Asia, Latin America, Middle East, and even those ‘Souths’ within a larger perceived North, such as the U.S. South and Mediterranean Europe. The study of these otherwise disparate and discontinuous areas, known collectively as the Global South, demonstrates that as globalisation pervades the planet, the south, as a synonym for subalterity, also transcends geographical and ideological frontiers.